What’s more likely, peace in the Middle East or your workforce management and operations teams getting along? Most WFM and operations leaders can answer this one pretty quickly. But it doesn’t have to be contentious between these two critical groups. Ultimately, these are two critical cogs in a well-oiled machine. If they don’t fit together perfectly, the machine breaks. Often this relationship is left to chance. Teams that have strong leaders and naturally collaborative team members end up with a strong relationship. Teams focused on 100% production and heavily measured based on metrics tend to face a tremendous amount of conflict and finger pointing between these teams. We work in a very stressful environment and without taking an active approach to relationship building, it’s easy to fall into a bad place. Expert Talk from PlanCon - Watch now! 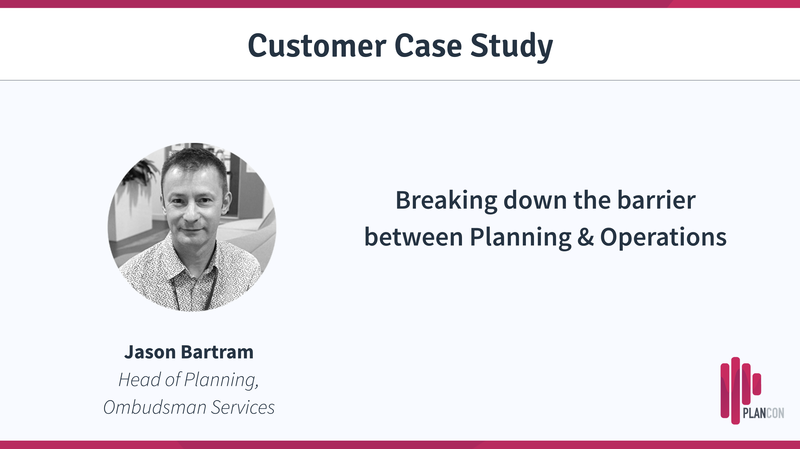 Jason Bartram shares how he managed to transform his contact centre that was paralysed by unclear roles and responsibilities within one year’s time to win the "Contact Centre of the Year" award in 2017. So, how do we create the optimal relationship between these groups? First, it’s important to spend a little time on why there is conflict in the first place. The operations team (team leaders and managers of the front-line agents) have one of the most challenging jobs in the business. They are required to meet a multitude of measures across all areas of the business, and those measures get more and more challenging every year. As businesses look for ways to reduce costs, these leaders take on more administrative responsibilities. Despite the reality of all of this work, you’ll often hear they are responsible for one thing; coaching. If you talk to WFM, they are responsible for something completely different, making sure their people are where they are supposed to be. Workforce Management professionals have a different challenge. They have a much narrower focus, and it tends to be a lot more data-driven, this has advantages and disadvantages. A clear advantage is that it’s easier to create algorithms to predict an outcome, such as a forecast or a staff requirement. A disadvantage is that sometimes the data can be so complex that it becomes a challenge to convey what seems like a simple concept to someone not intimately familiar with the data. The Workforce Management professionals are actively engaged in planning, scheduling and real-time management. All of the problems of efficiency and service level management are right there on their screens. All...day...long. This allows the teams to engage in a stress-free, peacetime environment. Create an agenda that both teams can contribute to. It’s OK that each team has different objectives, but where there is overlap, the goals need to be aligned, or it causes unnecessary conflict. An example: A team leader responsible for attrition and WFM responsible for Occupancy. The higher occupancy goes the higher attrition is (as you start to approach 90%+). WFM and team leaders will be in opposition here. As annual goals are being developed, leaders of WFM and operations should share their goals with the other team and get feedback. Relationship building is about people. 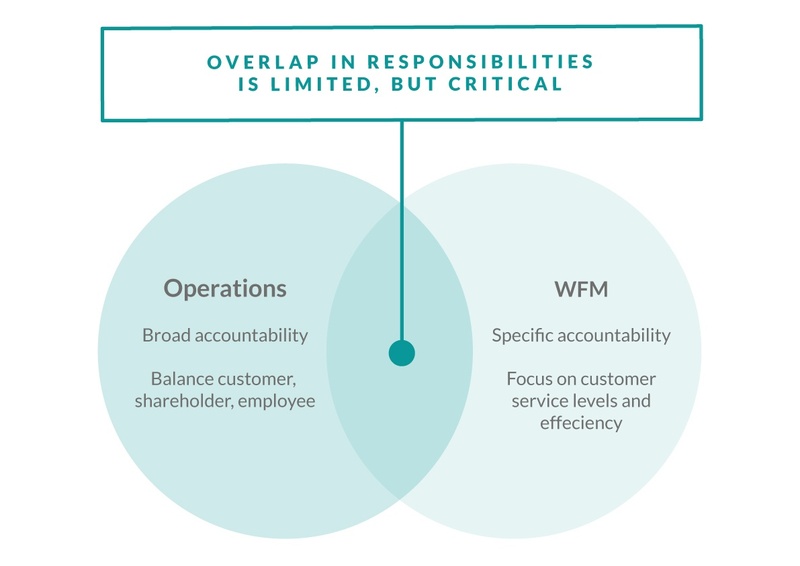 Too often, WFM and operations engage only when there’s work to do. Go to lunch, coffee, or for distributed teams, play games on conference calls. Encourage your teams to be curious about who their counterparts are and what they do. Encouraging curiosity will help drive positive engagement. If this is absent, often people become suspicious about who their counterparts are and what they do. Leaders of WFM and operations should spend time getting to know the individuals on the other team. Remember, you are not just a leader of your team, but a leader within the organization. An operations management team is an orchestra. It’s not enough to just have each section doing its best. You need everyone in harmony, synchronizing. It takes a tremendous amount of work and dedication to make it a priority. Building and maturing this relationship takes effort and focus. In the challenging world of contact centers, this won’t happen overnight, and it begins with the leadership teams setting the stage for success by ensuring the teams can partner together and are positioned to leverage their synergies and not focus on the “blame game”. Additionally, this strong relationship ends up driving collaboration and innovation. As the business environment becomes more challenging, those that can innovate and leverage the shared talents of their employees are best positioned for success. Try some of these techniques and see how they work! Feel free to share any thoughts or ideas you have that have worked for you in the past here.